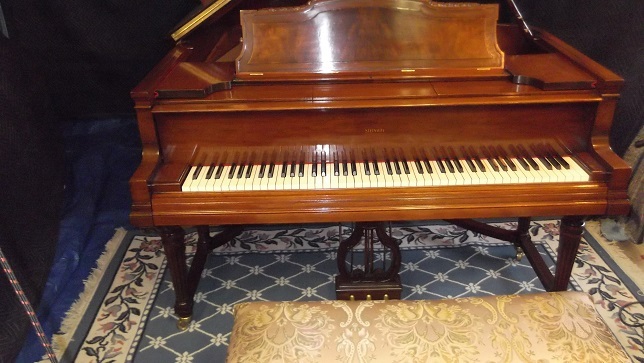 The Steinway OR model has the string scale of Steinway's popular parlor grand, the 5'11" Steinway model O, but built into a case 7 inches longer to hold the Aeolian Duo-Art reproducing player action that . This family heirloom instrument built in New York in 1927 came to Historic Pianos needing rebuilding of both the piano and the player. The piano had been restrung several times with increasing large tuning pins, to the point that the pinblock would no longer hold a tunining sufficiently. The player was entirely non-functional. And the case had suffered significantly from mosture and light damage, along with corrosion of the plate and strings from spills and humidity. Restoration included replacing the pin block, repairing soundboard and bridges, repairing case veneer, refinishing the soundboard, bridges, and case, and restringing with new custom bass strings, new treble wire, and new stringing and damper felts. The action was fully restored with shaping of the original hammers, and a full inertial rebalancing of the action for a light, responsive touch. The player was also fully restored with new pneumatic fabric, leather, and fabrication of some damaged and missing pieces. The matching artcase bench was also restored, with repair of the wooden frame, and complete reupholstery using traditional tied spring suspension.